The Silver Oak Casino is powered by Real Time Gaming (RTG), a well respected software provider. The casino offers good game selection, lots of great promotions and around-the-clock customer service. Members can rest assured that RTG provides effective security. They update their software on a consistent basis in this regard as needed or they see fit. Silver Oak Casino recently purchased the member base of the now defunct Crystal Palace, after its owner, Warren Cloud passed away. Silver Oak accepts players from all over the globe, including the United States. Real Time Gaming is a well known and highly regarded casino software development company. They have developed a reputation for creating software that has attractive graphics, great functionality and good speed. RTG offers about 100 games, including slots, traditional and video poker, scratch card games, Sic Bo, roulette and craps, amongst others. The amount and types of games available at the website are pretty standard. Most online casinos offer similar games. RTG competes well on this front. The Silver Oak Casino has a very attractive website. It is easy to navigate. Members shouldn’t find it difficult to add money to their accounts, locate game schedules and withdraw winnings. The website is clearly marked with bright, descriptive tabs. Silver Oak offers more than just games, they also have a training component. They offer it mostly in the form of articles written primarily about gaming strategy. There is also a section designated solely to industry news. 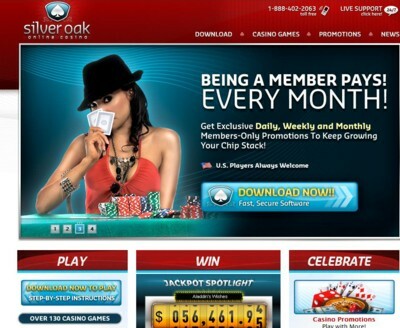 One of the greatest strengths of Silver Oak Casino are the promotions they offer. They make bonus monies available to both new players and already established one. The latter is especially noteworthy. There are some casinos which solely focus their attention on gaining new members, offering them huge bonuses in order entice them to join their site. They fail to take care of the players who are already investing their money and time there. RTG and Silver Oak Casino don’t make this mistake. Newcomers are awarded a100% match on their first two deposits. The first bonus is valued up to $300 and the second, up to $450. Individuals who are already members at Silver Oak Casino can qualify for cash back promotions, weekly bonuses and discounts on certain games. The security at the website is of a high standard as they are Technical Systems Testing certified. Silver Oak uses Secure Socket Layer Technology to ensure that all transactions are protected. Members will be able to deposit funds in a variety ways, some of the most popular include Mastercard, Visa, Click2Pay and cash transfer. The currency utilized at the site is the U.S. Dollar. 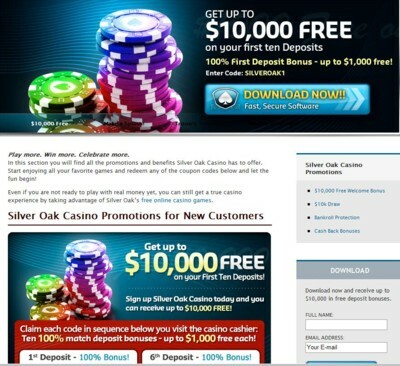 Silver Oak Casino thus far, seems to be a good option for individuals looking for a place to gamble online. They are powered by Real Time Gaming, a very well respected casino software development company. RTG software has good graphics, a nice selection of games, generous bonuses and easy navigation. Besides the large availability of games, Silver Oak Casino also provides some basic gambling training in the form of articles as well. They also report on what’s happening in the industry. Individuals who decide to join the site will be eligible for a 100% match on their first two deposits. Members who gamble at the site regularly will also be eligible for bonuses and promotions. I’m looking for a casino so i can take their bonus using basic strategy at blackjack?